It’s fair to say that, over the last few years, I’ve tried out a few different camera systems. Here’s what I’ve learned. A quick note: this is about my own personal needs, and a few lessons learned in finding them out. Your own requirements may differ. You shouldn’t necessarily take this as advice on what you should do, although I think most of the lessons I’ve listed towards the end of the article can apply to anyone. Since 2015, I have used several different Fuji APS-C cameras and Canon 1″-sensor compacts. While I loved how small and light the Canons were, ultimately the image quality – while adequate for my needs – wasn’t sufficiently better than a phone camera to justify carrying one. For me, APS-C is the sweet spot, but I have had a number of problems with my Fujis. 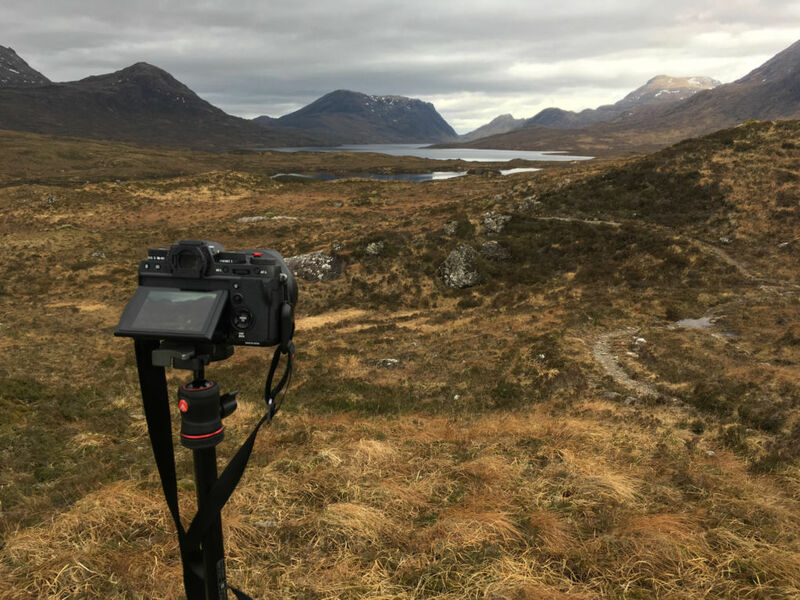 The final straw came on the Cape Wrath Trail in February 2019 when my Fujifilm X-T2 developed several faults. The eyecup broke, the autofocus selector switch failed, and movie recording stopped working. The setup (with 16–55 f/2.8 zoom lens and full-height tripod) was also far too bulky and heavy, and the image quality from the expensive 16–55 was distinctly underwhelming anyway. After a couple of weeks I was seriously regretting my decision to take so much camera gear with me on the trail. I could have achieved the same images with half the weight. So, after four years, I am done with Fuji. I’m fed up with constant reliability problems, and the gear is heavy for APS-C.
After talking about camera systems with my brother James and with Chris Townsend, I ultimately decided to copy Chris’s strategy and adopt the Sony APS-C system. I plan to use a Sony a6300 with the 16–50 f/3.5–5.6 pancake zoom lens for all my backpacking trips for the foreseeable future. While I love shooting with prime lenses, ultimately a zoom is more flexible, and provides you with more image opportunities. This is more important than my aesthetic preference for primes. The total system weighs 527g – less than half the weight of my previous Fuji setup. It also fits in a significantly smaller camera bag (my old Mirrorless Mover 5), which has multiple advantages on the trail: it’s easier to carry, easier to keep waterproof because you can bung the whole lot in your pack if it rains, and the bag itself is lighter. 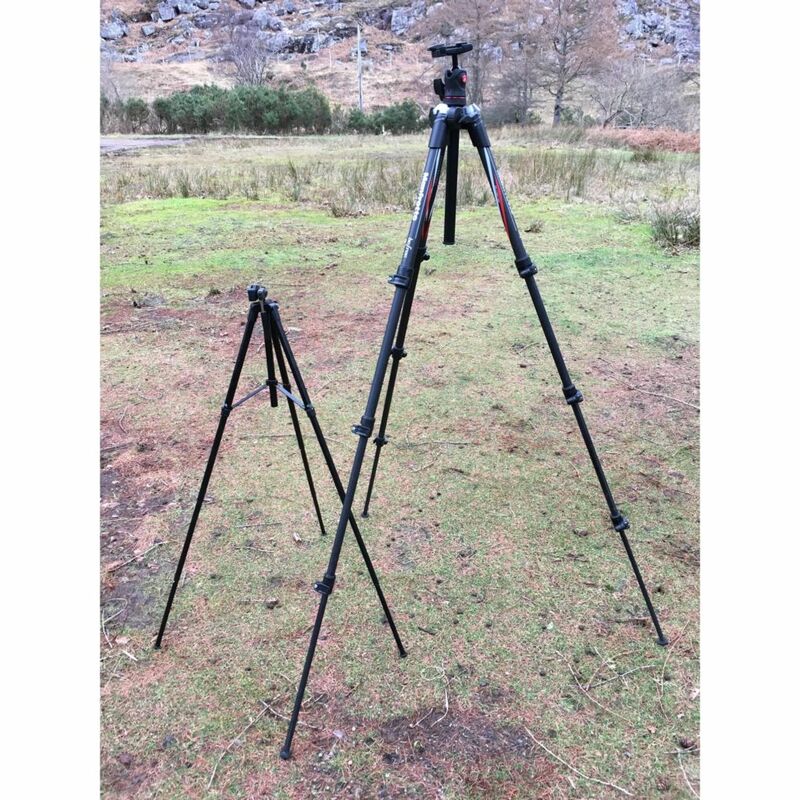 Due to the low size and weight, you can get away with a much lighter tripod. 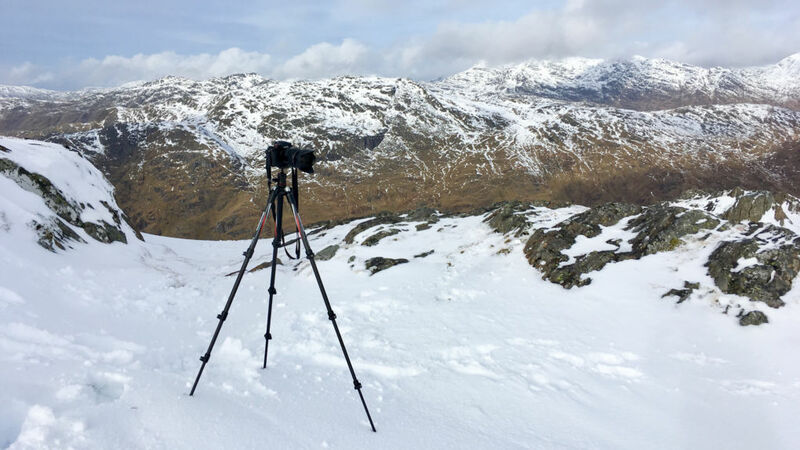 On the CWT in Feb 2019 I carried a tripod weighing 1.1kg because nothing lighter would support the camera adequately. 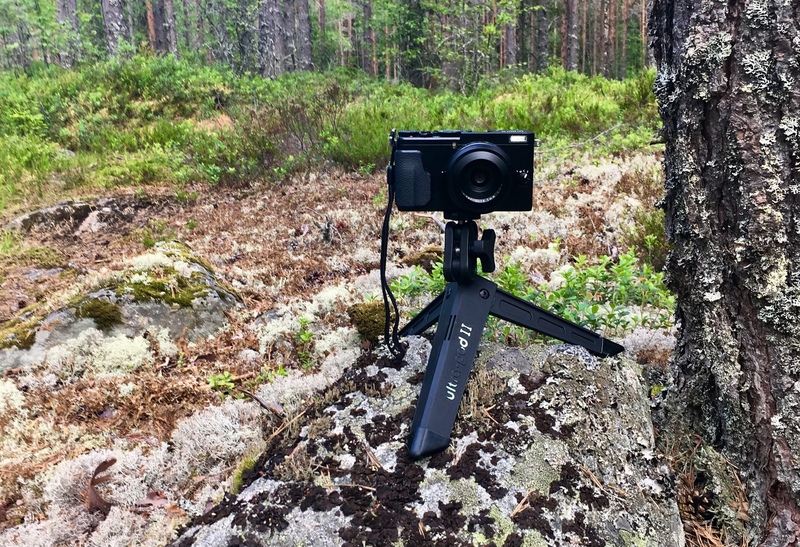 A lighter camera can be used with a lighter tripod, and for the Sony kit I’ll be going back to my pocket-sized Ultrapod camera support for most of my long-distance trails. This camera support is very small, so to get any height you have to prop it on a boulder or strap it to the branch of a tree, but with some patience it’s perfectly adequate. I’ve used the Ultrapod on many of my long-distance walks over the last few years. While I occasionally whinge about the inconvenience of not being able to set up a full-height shot wherever I want, I just can’t face the weight of a full tripod any more! Image quality is as good as or better than the Fuji. In my testing, the much-maligned Sony 16–50 kit zoom has image quality at least as good as the Fujinon 16–55 f/2.8 that cost an order of magnitude more and is the size and weight of a brick. I’m not sure if I have an exceptional copy of the Sony 16–50, or if my copy of the Fuji 16–55 was lousy, but the images speak for themselves. I’ll also add that Chris Townsend told me he was very happy with his 16–50 lens, and consistently found that it produced excellent results – despite what you’ll read about the lens in reviews online. For me, that endorsement carried more weight than a hundred poor reviews, because I know that Chris has used his setup professionally for years. Setting the lens aside for a moment, the camera itself yields image quality very similar to that of the X-T2, which is to say more than good enough for detailed double-page spreads in magazines. The Sony a6300 is described as ‘weather-resistant’, although it clearly isn’t as well-sealed as the Fujifilm X-T2 (which had rubber gaskets all over the place). The lens isn’t weatherproof in any way, but due to the small size of the total package it’s much easier to keep it out of the rain. I’m confident this setup will be weatherproof enough for my needs. The 16–50 lens has a comparatively slow maximum aperture of f/3.5, but this is wide enough to capture starscapes if you crank up the ISO. At some point I will be investing in the Sony-compatible version of the excellent Samyang 12mm f/2, which I had long used for astrophotography on my Fuji system. While I’ve been happy using cameras without a viewfinder, an EVF makes composing much easier, especially in bright sunlight. I find this essential when using a very low tripod such as the Ultrapod. There is no such thing as the ‘perfect camera’. I asked that question in 2017 when I used the Fujifilm X70 for a few months. It was good, sure, but there are compromises no matter what you choose. There is a lot of rubbish advice on the internet. If I believed what I’d read in reviews, I’d never have even considered the Sony 16–50 lens, which is almost universally panned. Weight is near the top of my list of priorities – but other priorities are compromised once you go beyond a certain point. Finding that sweet spot can take trial and error, which is ok. We all need to experiment until we find the right solution for our needs. My true needs are quite simple and basic. I really don’t need a constant f/2.8 zoom lens or a bag full of fast primes. I certainly don’t need a full-frame sensor. I can get by with a single wide-angle prime, but if carrying a single lens I now prefer a zoom. Reliability and simplicity matter to me. The superior tactile handling experience of Fuji cameras is far less important to me than I’d thought it was. All cameras are excellent nowadays, and the differences between them come down to details. When asking for advice, everyone will tell you to buy something different, because everyone has different priorities of their own. I recently published a guide to smartphone photography for outdoor writers. Since then I have upgraded my phone from the iPhone SE to the iPhone Xr, and I’ve been pleasantly surprised by the leap in image quality. When shooting in raw, the Xr yields image quality almost as good as the Canon 1″-sensor compacts I was using last year. However, my original piece still stands. While I could get by with just the Xr and still come back with publishable images if I needed to, a dedicated camera system with a larger sensor will capture more detailed images at a higher resolution with less noise. The handling of a real camera is better in bad weather or while wearing gloves, and a lens with optical zoom provides greater flexibility. Other features such as a tilt screen and replaceable batteries/memory cards are icing on the cake. I’m very pleased with the upgrade, though. The iPhone Xr will make a far more competent secondary camera than the SE was. We have long been past the point where phone cameras are good enough for most people for personal use, of course. If my images weren’t destined for publication there wouldn’t be a debate here! I’ve been shooting casually with the Sony setup for a couple of weeks on my local walks, so the true test will come on my next long-distance trail. 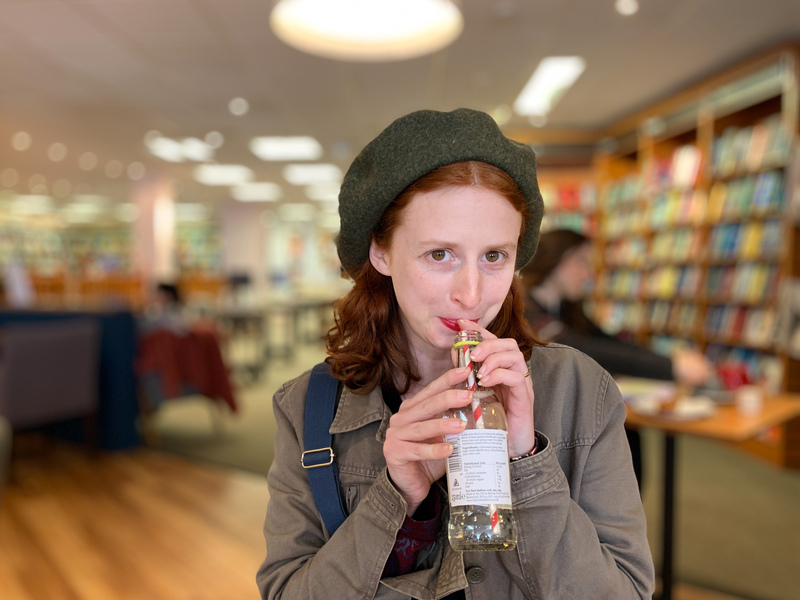 It’s my hope that, having tried a variety of alternatives, this will be the system that fits my true needs best – one I’ll stick with for more than a year or so! Time will tell. Thanks for the info. I’m sort-of thinking about a “big” camera again, and your perspective will help. I got a Panasonic G1 just before the last one was bought by someone else. Fine camera and lenses, but it was both too big and too small. The camera body+lens wouldn’t fit into a pocket, and the sensor, while fine, was also maybe a bit smallish and compromised. I’m mostly shooting ad-hoc wall art and odds and ends of graffiti these days, and my 1/2.3″ and 1″ sensor cameras are fine, and amazingly capable, but not great for landscapes. If I want to go big again, it looks like APS-C should be the target, so a Sony with the lens you’ve got might just be the best bet. The big savings clearly come in being able to ditch the heavier tripod! I have an A6000 and still pair it will a full height tripod (Benro TSL08CN00). That Ultrapod II is really cheap so it may be purchased soon to experiment with. My results with the 16-50 kit lens were not as positive as yours and I soon “upgraded” to the much heavier 18-105 F4 lens (451g excluding 25g hood) and have been pleased since. The extra range and quality are worth the weight for me. Although seeing the weight difference down in the screen now makes me sad, what I would give to save 325g in my base-weight elsewhere! Thanks for this – interesting comments! I gather there’s quite a bit of sample variability in the 16-50. To say I’m impressed with it is an understatement. It actually outperforms the ‘premium’ Fujinon 16-55 f/2.8 that I’ve now sold. I switched to Sony alpha 6300 last year and I’m really happy with this decision. 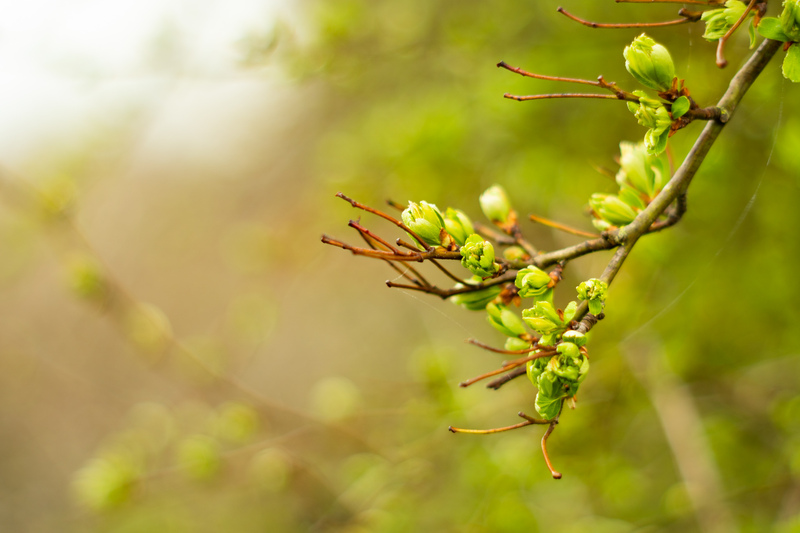 Before I used the compact Sony rx100 m3, which was a great compact – but I simply wanted better quality photos. I have three lenses now – the kit set, a wide angle prime and a new buy for the recent trek in Portugal – 4/18-105 (by Sony). This lens is big, so I got the peak design attachment to carry it – and I’m so happy I did! It’s secure and I don’t feel it’s there. I don’t carry a tripod – I only use natural support like boulders and then play with whatever I have to keep it leveled (mostly the camera’s strap). Alex, you need to switch over to Nikon. So I’ve been told, but nothing in the Nikon system is anywhere near lightweight enough for my needs, and low weight is near the top of my list of priorities! It’s a non-starter for me I’m afraid. That was an interesting summary, many thanks. It has helped to focus my thoughts on my next camera. Firstly though, thank you, you have restored my self esteem. When I read that you planned to take a Fuji XT2 and 16-55mm lens on your CWT stroll, I thought that I must be a wimp. I have that combo, superb for “not too far from the car” sunrise or sunset stuff, but for a 300 mile trek? No chance! The anxiety doubts of “is he younger, stronger, fitter” arose, but thankfully you extinguished them. Secondly, I can only assume that your 16-55 Lens was a duffer. The results from mine are superb. But variations in Lens quality are not unknown, as one of your commenters above has evidenced. Thirdly, as an iPhone SE user, I was interested in your comments on the improvements afforded by the XR. Food for thought! Lastly, I wonder what your recommendations will look like in 2020! Hi Alex. I’ve been using the Sony A6000 with the kit lens for about 3 years now and I find it great as a backpacking camera. 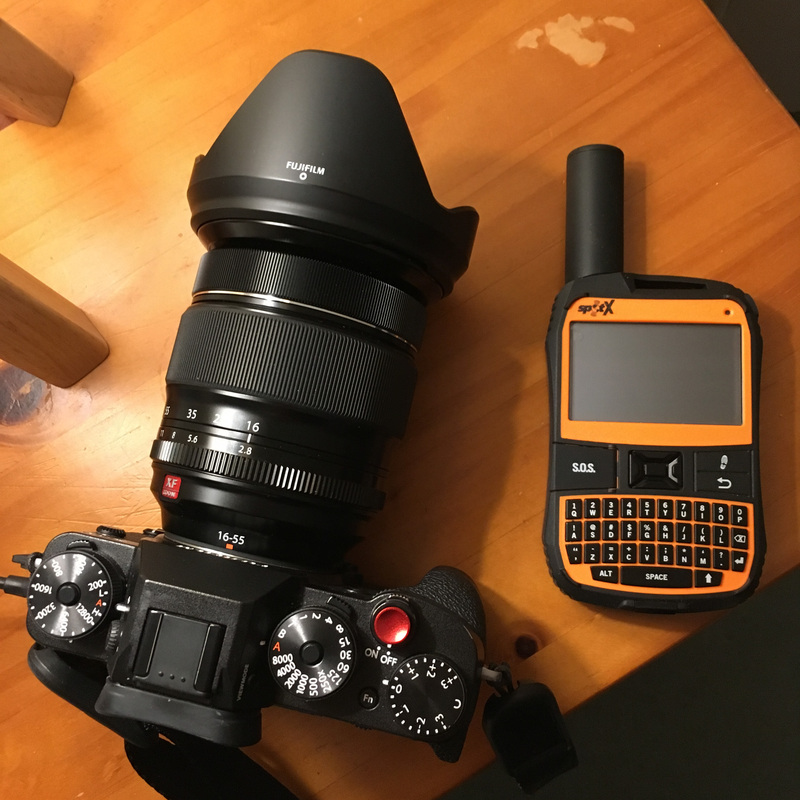 I can fit both and the Sony 55-210 zoom together with a phone and other bits and pieces in my OMM Trio pouch which I always take with me. The system is so compact and for me produces good results. I’m no real photographer but I do enjoy documenting my travels whether that is a evening walk in the Wolds after work or a trip into the hills. I’m hoping to upgrade to A6500 as a colleague at work is looking to upgrade his and I will buy it off him. My main camera is a Sony A6000 complete with a collection of fast prime lenses and the ubiquitous Sony 16-50mm, which I agree is pretty good. My photography is mostly of the urban environment, with some street photography thrown in and the A6000 is a great piece of kit. 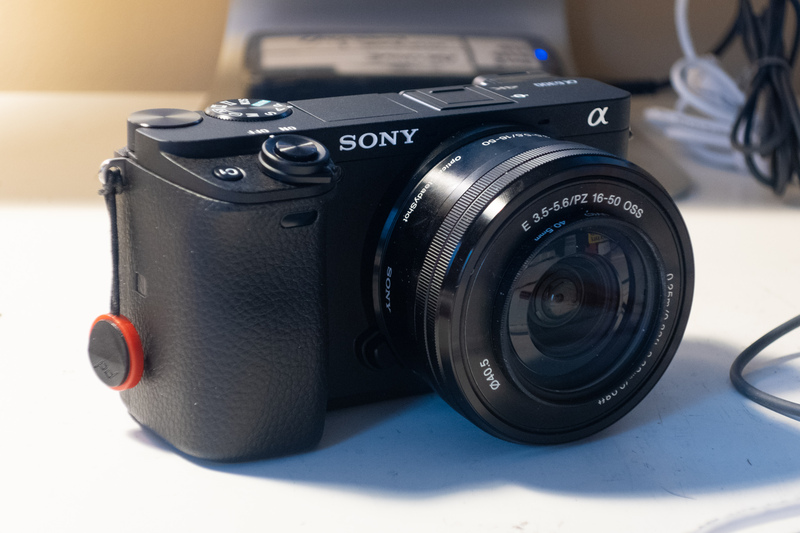 For backpacking, where I’m using a camera mainly to record my journey rather than producing some ‘fine-art’ type of image, I have found the A6000 a little too bulky, even with the 16-50mm. I tried using my old Sony NEX-5 as its slimmer but the weight and lack of a viewfinder bugged me for ultralight backpacking. I found that I left it at home more often or not. I have just acquired a used Panasonic Lumix DMC-LF1, which is small, lightweight and can be easily tucked into a pocket. I shoots RAW, has a viewfinder, a fast lens and I can bracket my shots. Yes the sensor is smaller but on the basis that the best camera is the one you have on you at the time, I feel that its a good compromise. If I felt the need to do some ‘seroius’ landscape photography, then I would definitely take the A6000 with a Laowa 9mm/f2.8 or the Sony 16-50mm.